The Ridgid R175RNF Coil Roofing Nailer quickly won me over. At $199 with free o-rings, piston stops, and driver blades for life, it's a slam-dunk. The last time we talked about roofing nailers, I told you that although there’s more variation among them than framing nailers, there’s still not a ton of differentiation. But it’s the weight that really tips the balance – pun intended – in favor of the nailers I prefer. Most new roofing nailers really just tinker around the margins because, of course, if it ain’t broke, don’t fix it. Still, there are some interesting features of the new Ridgid R175RNF Coil Roofing Nailer that might make me reconsider my not-so-different stance among product offerings. Let’s take a closer look. Well, this nailer is light. It’s the first thing I look for since I know I’ll have to hold a tool up for hours or days. It’s undoubtedly due to Ridgid’s magnesium housing. I also really like the thinner handle overmolded with Ridgid’s Hex Grip, which has become a favorite of mine. The depth of drive adjustment is a dial near the trigger instead of on top of the nose like other roofing nailers I’ve used. My first thought is that it might not be as easy to see the depth of drive on the side as it is on the top of the nailer, but I’ll withhold judgement until I’ve used it a bit. The installed swivel quick connector is a nice touch since it makes maneuvering the nailer easier with the hose attached. I also like the wear guards on the side of the nail canister – they will certainly help maintain the cosmetic and functional parts of the nailer. Finally, it comes with a wrench and your first few ounces of oil. I don’t want to give the game away, but the slim, Hex Grip overmold makes the Ridgid R175RNF Coil Roofing Nailer a breeze to operate, and the light weight is second to none other I’ve used. I used this nailer all around a house remodel and on some new construction we’re doing. The nailer’s nosepiece has carbide inserts and delivers 1-1/2- to 3-1/2-inch fasteners and includes a dry fire lockout. The fasteners move smoothly off the collated coil. The combination resulted in zero jams or misfires so far. I thought I might not like the depth dial’s placement but it’s really not a problem. 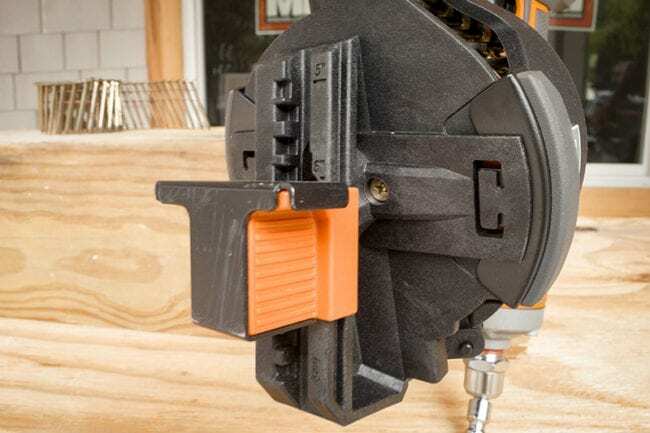 Although other nailers’ have big, bold numbers that you can easily read, the Ridgid’s dial position underneath the nailer protects it from wear and tear. It will likely be a matter of your preference. The spring loaded basket is also easy to adjust to various nail lengths. This is simple and intuitive – some nailers are really a pain in the neck in this department but I like what Ridgid has done on this model. There’s a simple and safe contact (bump) fire or sequential fire selector. You depress a safety button and move the knob to change between modes. There are times when both modes are appropriate but, of course, you always need to use an extra measure of precaution with bump fire because of the slim chance recoil could cause any nailer to fire off a nail in a direction you didn’t intend. This nailer’s recoil is about the standard for roofing nailers. It’s nice having the bump fire or single fire actuation option. Single fire gives you more control in tight spaces. If you use bump fire in tight spaces there’s a chance that the gun can recoil, hit something behind it, and then be pushed back to the nailing surface to shoot another nail you didn’t intend. I save bump fire for shingles and house wraps and prefer single fire for the rest. The removable tool-free shingle guide adjustment is well designed. It moves easily up and down the track with the push of a button, but you can also take it off the nailer easily to give you more room in tight spaces. This is a better feature than other nailers I’ve used. Finally, the exhaust diffuser with muffler that does an adequate job. 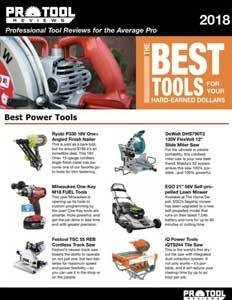 The Ridgid R175RNF Coil Roofing Nailer quickly won me over. At $199 with free o-rings, piston stops, and driver blades for life, it’s a slam-dunk. I highly recommend it. This nailer should fire a range of nail lengths from 3/4″ to 1 3/4″. There must be some confusion with the siding coil nailer.